They say things in life happen for a reason. Someone comes into your life at the right time and you just know they’re something special. For Joan, the decision to adopt another dog into her family seemed like a distant possibility after her beloved Labrador passed away in 2014. However, once she was introduced to charismatic one-year-old terrier, Lola, she knew this was going to change. 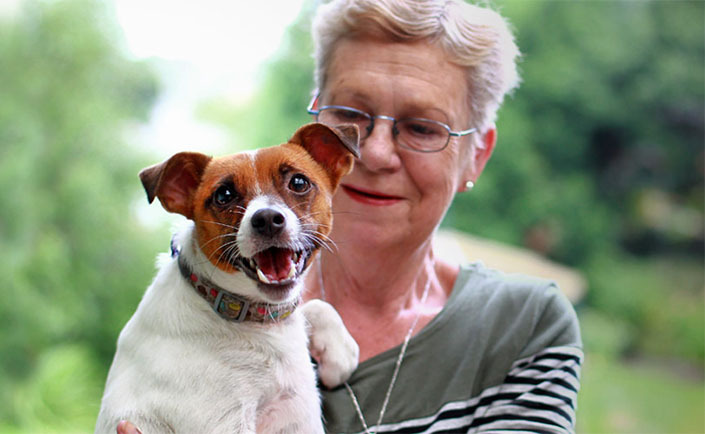 “My daughter Jacqui thought now would be a good time for us to adopt another dog. 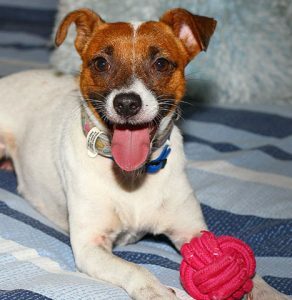 She first saw Lola on The Lost Dogs’ Home website and went down to the Home’s North Melbourne shelter to meet her and she knew my husband and I would fall in love with her. The next day I visited the Home with Jacqui and my grandson to meet Lola myself. When I met her, I knew straight away she would be a lovely addition to our family,” said Joan. Since that fateful day, Lola has made herself at home, and has quickly become a key part of the family. “Lola is as good as gold; she runs the place! She loves going for walks and as soon as she gets home she runs straight over to my husband to say hello. But, just because she is well trained, doesn’t mean Lola hasn’t got up to a little mischief. “Lola is able to jump on top of our kitchen bench. One night, I was cleaning up and I noticed potato paddies on the kitchen bench. After a bit of sleuthing we discovered Lola had eaten the leftover potato paddies! Lola is just one of hundreds of dogs and cats benefitting from your kind gifts this winter. Just one donation will help ease the suffering of animals in need. Click here to find out how you can help this winter.